Portable "Back Saver" - the wheel and handle kit instantly makes your test pump truly portable and easy to maneuver, saving you time, labor, maintenance, and repair. The new "NO FLAT" tires are made of polyurethane foam with open and closed air cells, creating a tire 2 times stronger than rubber, yet soft enough to provide bounce and absorb vibration. All small (RI-6), standard (RI-8), and extra large (RI-10) framed units are wheel kit ready and this accessory can be added at any time! Hydrostatic Test Pump. The DPH-56/250 is an extremely large volume low pressure hydrostatic test pum..
Hydrostatic Test Pump. The TRH8 is a medium volume high pressure hydrostatic test pump designed for ..
Hydrostatic Test Pump. 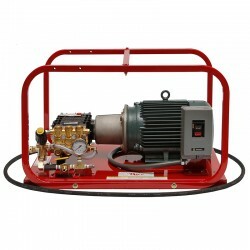 The TRH-10 is a medium volume high pressure hydrostatic test pump designed fo..
We Offer Free Shipping Only To Commercial Business Address With Forklift.Hydraulic Shoring Pressure .. The EL-8/12 model hydrostatic test pump offers 8 GPM up to 1200 PSI, is designed for testing sprinkl.. The DPH-8, is a triple diaphragm, gas powered “Honda” hydrostatic test pump, offering large volume a..